After the first two updates (both in this post), I got along fairly well with the SMP. It got put into my regular rotation and it was fairly accurate (~+2s/d). However, I noticed two things: (1) The GMT hand would sometimes get stuck at 8am. And (2) the GMT wheel did not click from hour to hour when I was quick-setting it. Another minor issue was, that the crown seemed to be on the way out. It required a deft touch if I wanted to wind the watch, otherwise it would slip.The dealbreaker was the GMT hand. I figured I would need to open it up again to sort the hand. I did not yet know what the problem was, but I thought that either the hand was loose or that the dial opening was uneven. 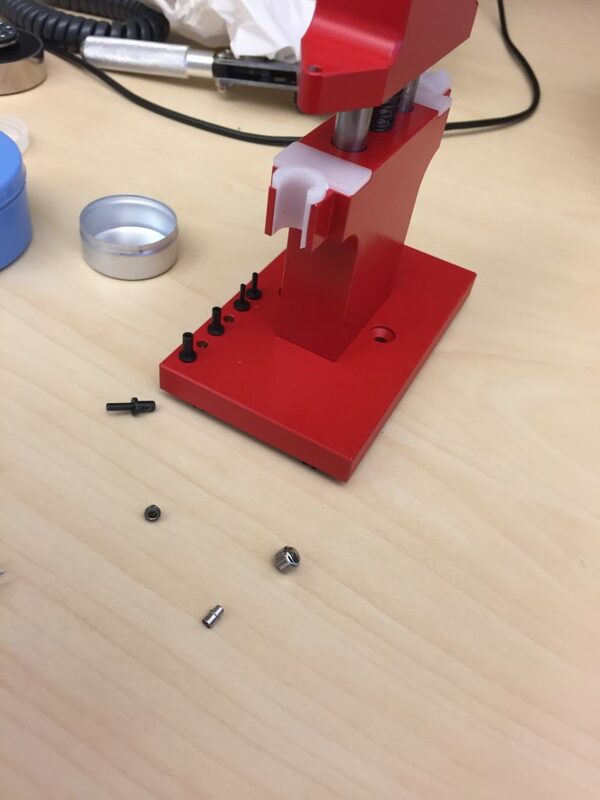 Because the thread in the back is not sealing perfectly – it is water-resistant to 60m (with the new crown), but still, it bugs me that I cannot screw it tight. The case-back itself (more on that in a second). I followed the excellent Archer’s guide on how to remove the crown and everything proceeded without a hitch. I used an aftermarket Clarks crown and tube (I know this is advertised as genuine, but it isn’t really. It is, though, half the price of the genuine crown and tube). When I got the crown out it became apparent why the backup case was not watertight previously (the crown tube hole was malformed). It was also too big for the tube I had. I used marine epoxy, put a thin film around the crown and pressed it into place. Waited 24 hours, repressed the crystal, lubbed everything, sealed as far as I could and then tested it. It passed! But the only case-back that fits that case does not have a display window. If I borked up the case that I use currently, this one would work, however it would not be ideal. The 2535.80.00 has a display back (as indeed the case I currently use, does). 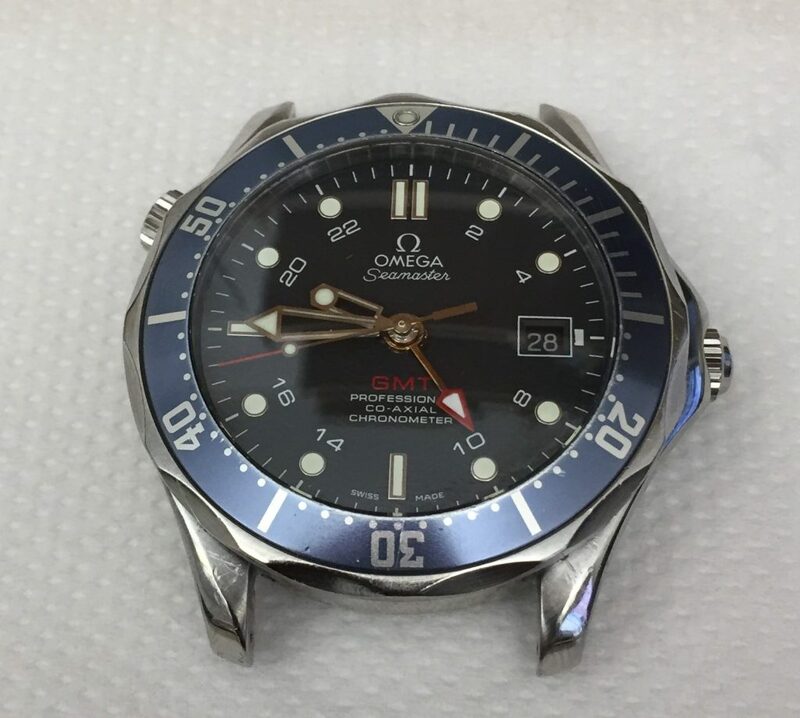 In the meantime, I also bought a genuine bezel with blue insert. Here is a comparison photo between bad rep, passable rep and genuine. 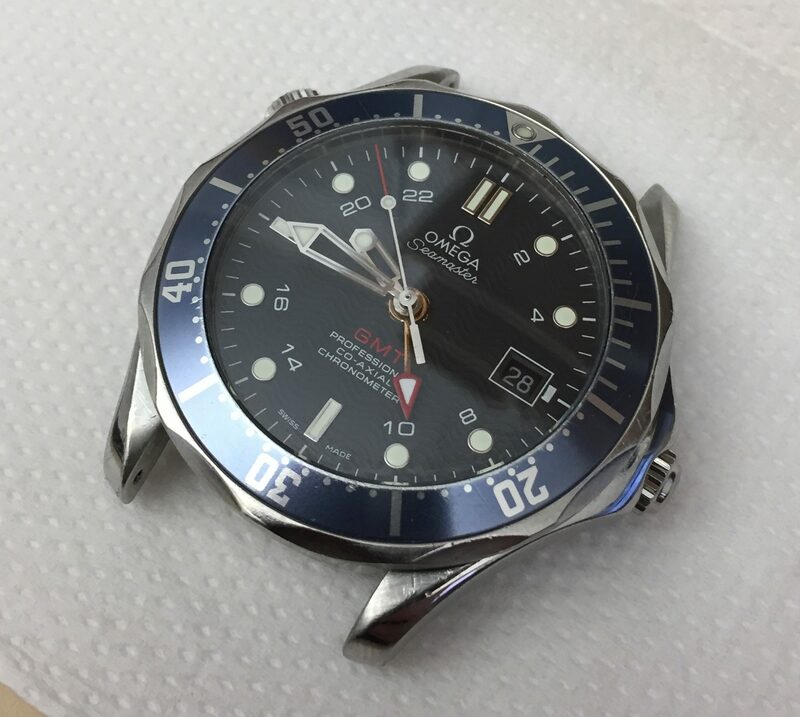 As you can see the replica and genuine inserts are subtly different, especially at the lume pip. The genuine insert has an additional steel circle around the pip. 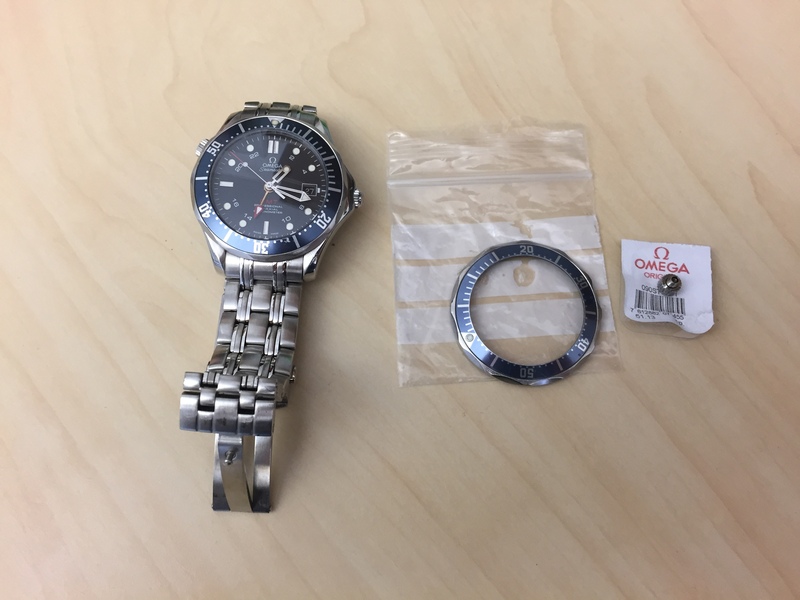 Note that omega does not sell the bezel and the bezel insert separately, so the ring needs to be replaced too. 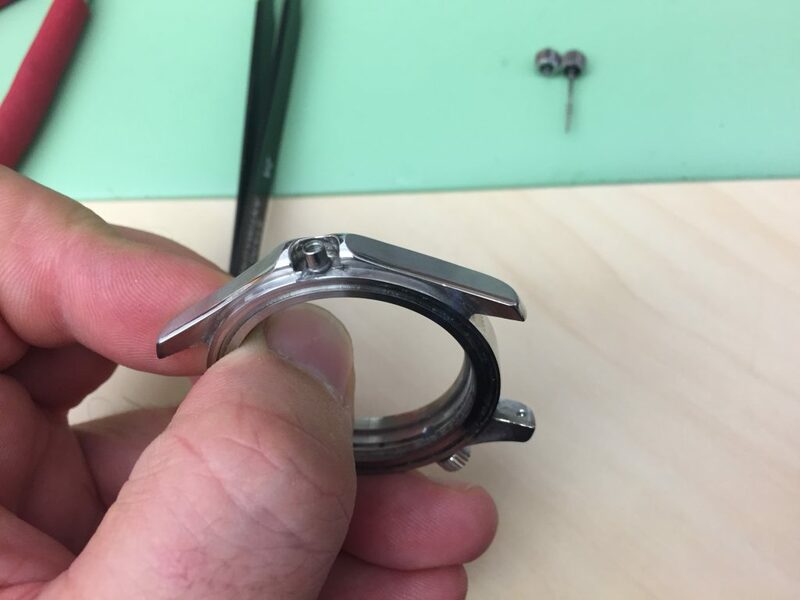 The replica bezel works on a spring wire, or with a little pip on a spring. The genuine has an insert with a raised piece of metal that works as a clicker. Below you see the three bezel backs. The middle one is genuine, the left and right ones are replicas. I left this issue to one side for the moment, since I needed to completely disassemble the case anyway. 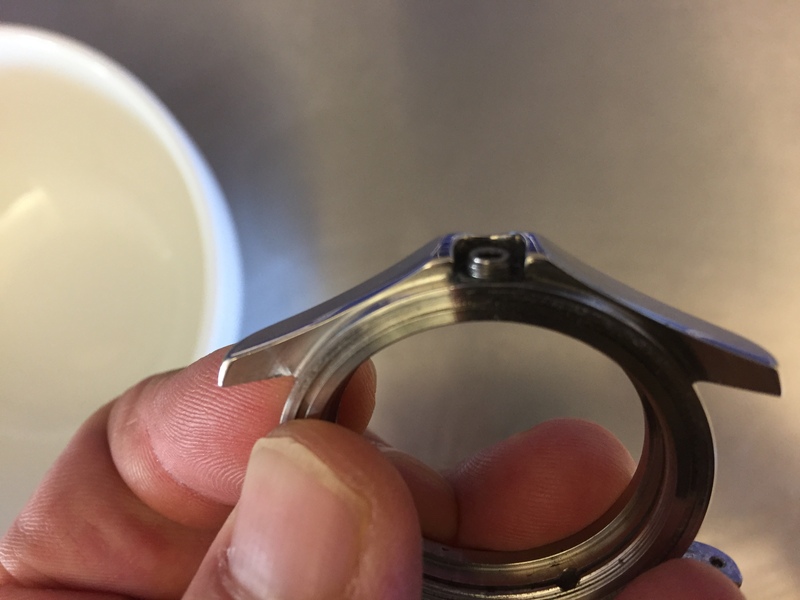 One suggestion put forward in the guide linked above is to put the case into boiling water in order to loosen the Loctite securing the crown tube in place. In order to do this, you need to remove all the gaskets (the one in the back and the one between the case and crystal). 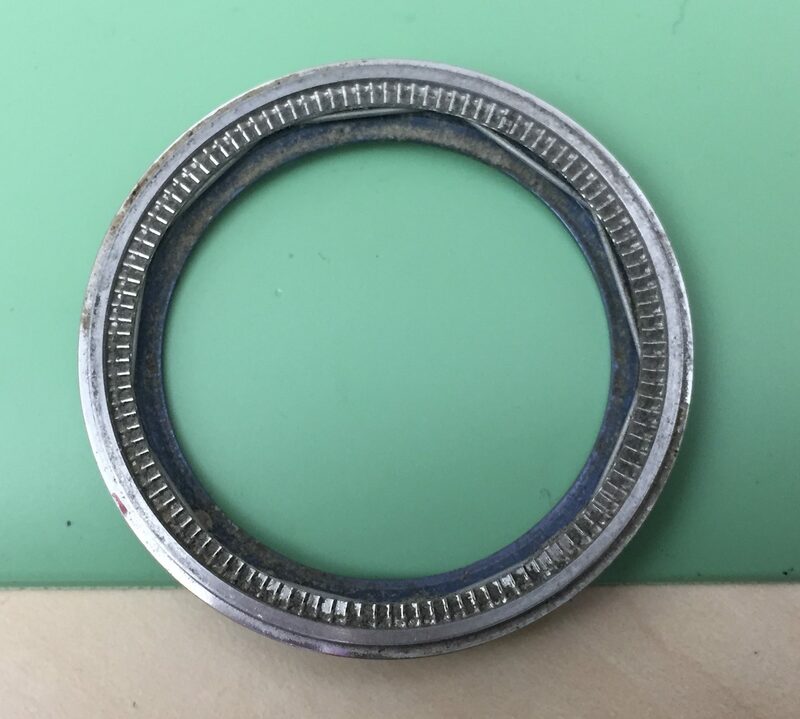 You also need to remove the bezel and insert, and the crown, obviously (because there is a rubber gasket in the crown itself). 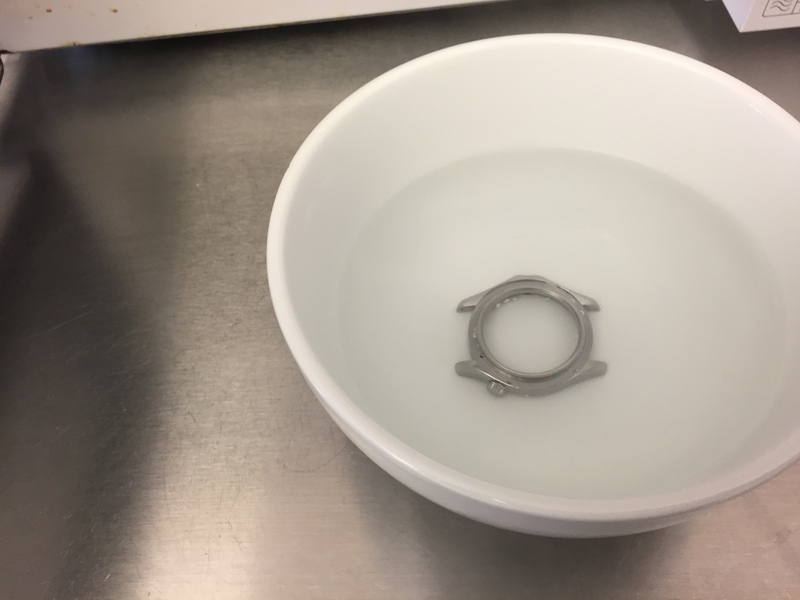 You also need to remove the bracelet, because the springbars have springs inside and the whole thing will get destroyed by the boiling water. I proceeded with dissasembly. And removed everything from the midcase. I boiled it for about 10 minutes, dried it off. And then pushed the crown tube out without much difficulty. 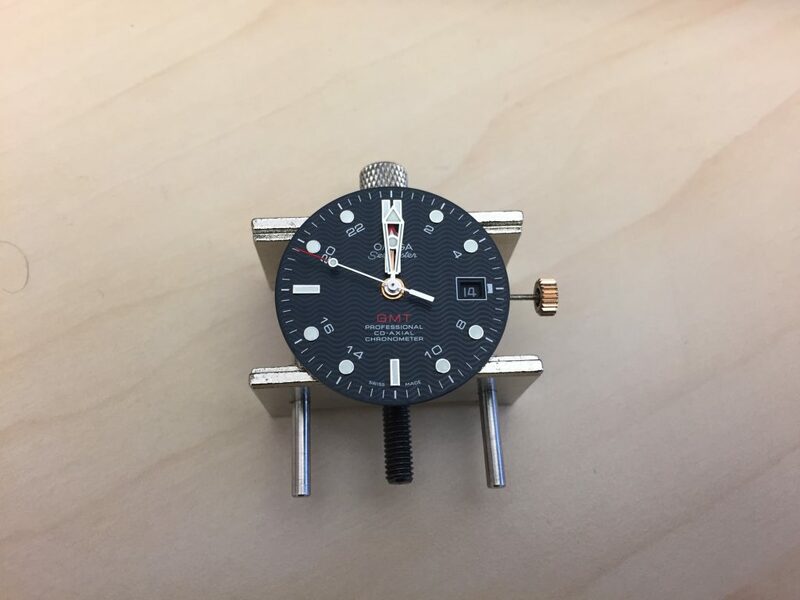 Note to self – the SMP cases, especially the GMT case, need to be put on the machine crystal side in, otherwise, they slip and break the pusher (I have now ordered several spare pushers:) ). When I put the crown tube in, it did not fit perfectly, there was a bit of space between the case and the tube. Not much, perhaps 0.1mm, and it might be solved with loctite, but I would never be sure about its resistance to water ingress. Therefore, I mixed a bit more marine epoxy and pushed the crown into place. I now had to wait 24 hours for the epoxy to dry. Therefore I could turn to the movement. I replaced the GMT wheel, so I got the click back. I replaced the datewheel for the hell of it and used a diamond file to smoothen the edges of the dial opening. 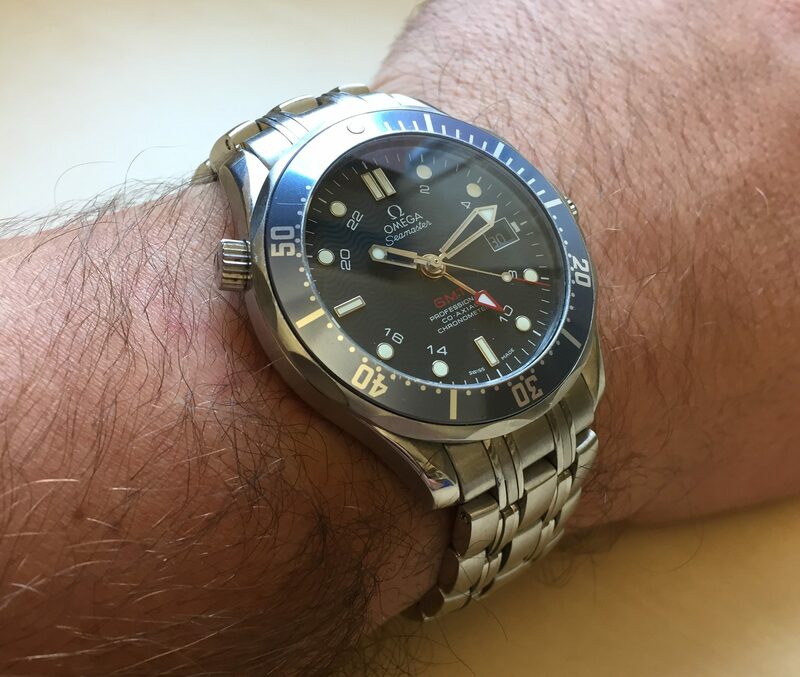 I also put just a dab of loctite on the GMT hand once I had it perfectly in place. 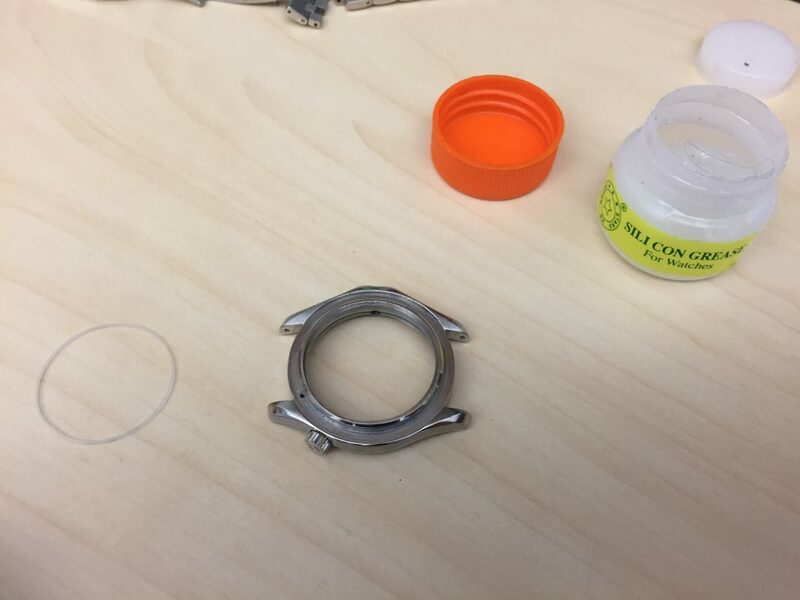 I reassembled the movement and left it running outside the case, to let Loctite dry (with many of these cemicals and glues, I am worried that the fumes in a watertight space (like closed watch) will stick around and slowly erode the hands, dial and movement). The other reason I left it outside of the case was that I wanted to see whether there was an issue with the hand clearances (a lot easier to reposition the hands while they are stil outside the case). While I was at it, I also replaced the stem, because the existing one looks to have been previously damaged by the pliers. Not strictly necessary, but since I had everything out, I might as well do it. While I was waiting for the tube to dry, I lubbed the gaskets and re-pressed the crystal. 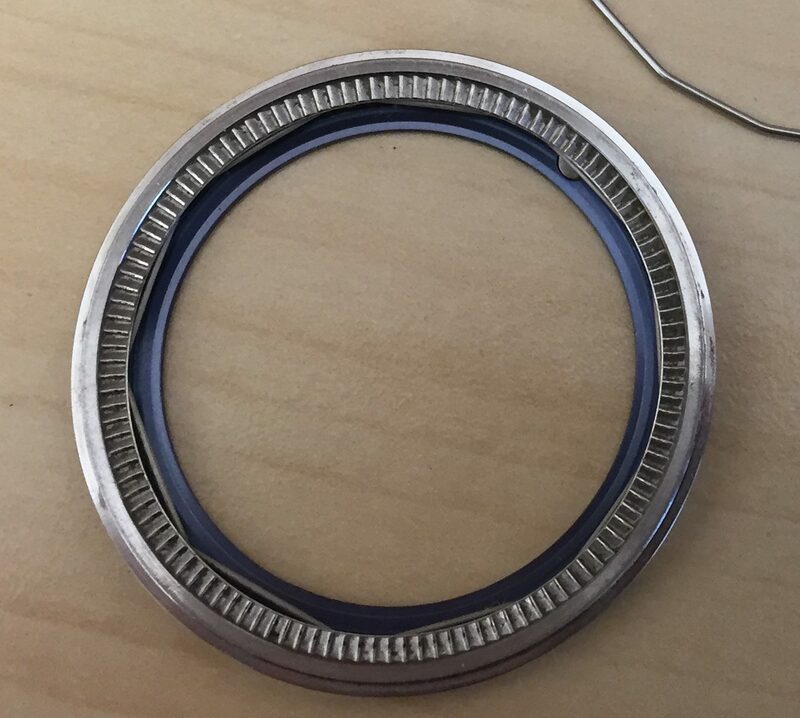 Note to self – How happy am I now that I previously bought the crystal gasket replacement(s)? I am very happy :). I cleaned the crystal and re-visited the bezel issue. 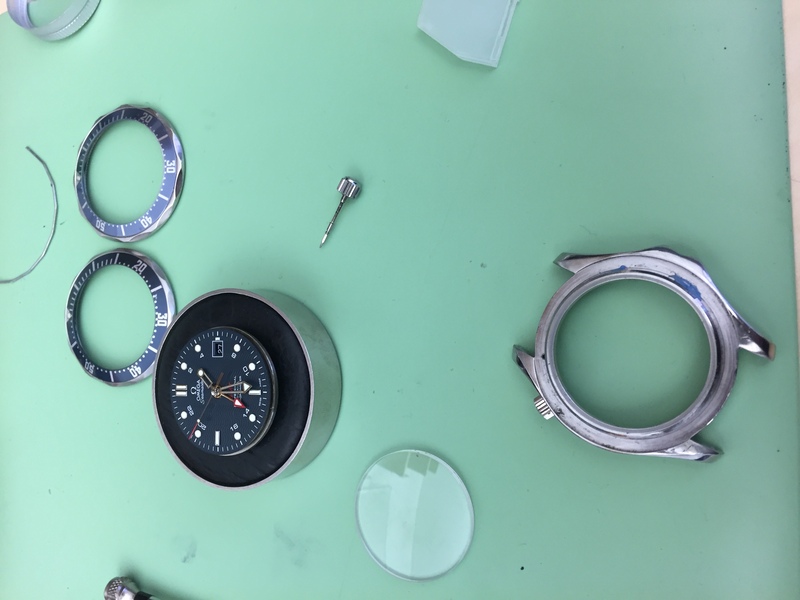 Drill a hole in the case and insert the steel pip (like Rolex has them). The hole dimensions are Diameter: 1.6mm, Depth: ~3.3mm. Buy a genuine disk spring. Does not apply for this particular midcase because it does not have a drilled path for the disc. Replace the insert only. 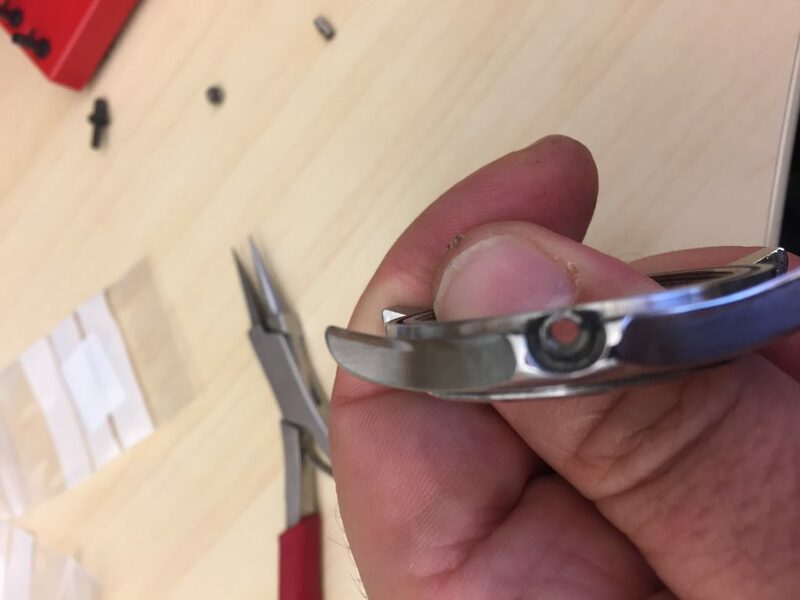 While I was taking off the genuine bezel to drill a hole ( I had it on, but it was not flush with the crystal, so I removed it again), the bezel insert fell out of the genuine disc. So, 3 it is. 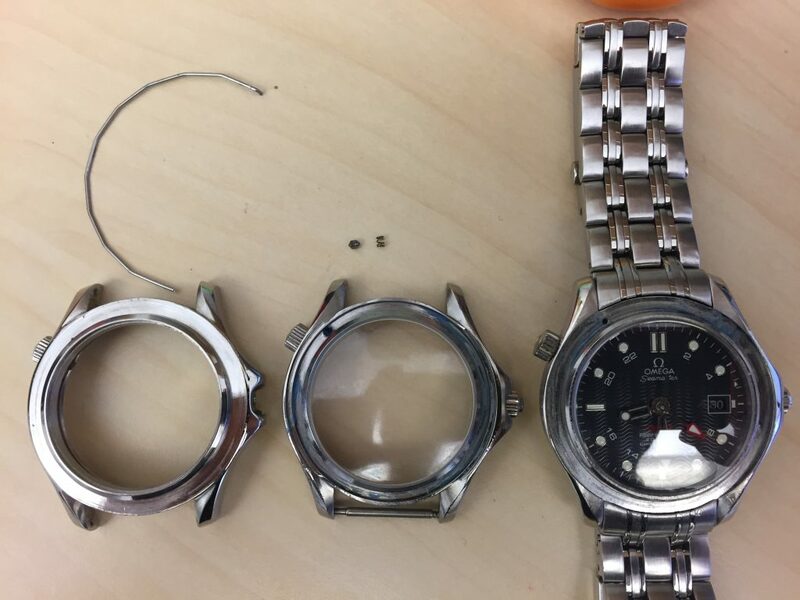 Here are the two solutions rep cases employ, on the left and right there is a hole and a spring wire (above the left watch case). The middle case has a larger hole and the pip and spring. While I was at it, I realised that the genuine insert is just a bit too tight for the crystal. I needed to uniformly enlarge it, just a tad. So I did. Once the case is ready and the tube to dry, then I’ll need to lube the bezel assembly and press it into place. 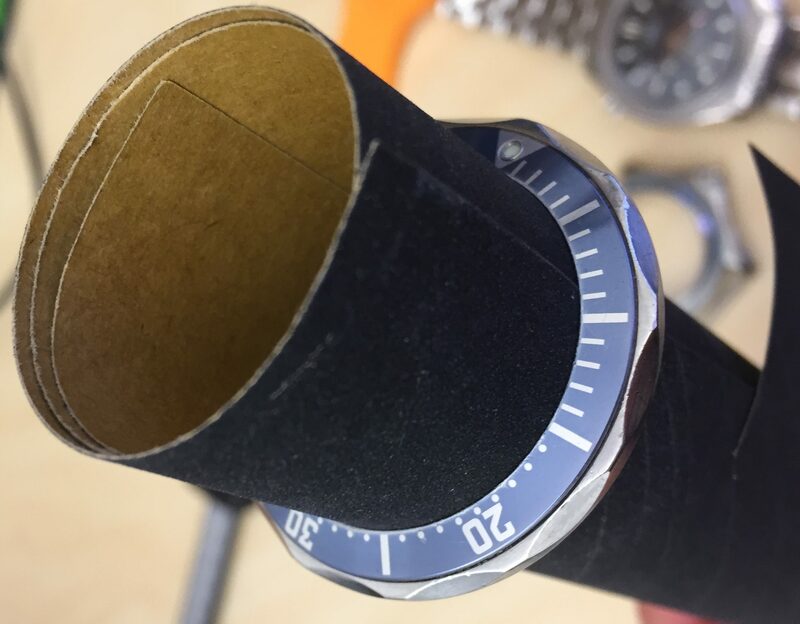 Everything else is ready for reassembly as soon as the epoxy in the tube dries (I protect the hole in the tube with rodico/watchmakers putty). A day passes. I re-visit the GMT. The movement has cheerfully worked through the night. No need to do anything with it. I oiled the stem with (Moebius Synth 9415 lube). The tube is firmly epoxied in place and is not movable at all. I lubbed the back gasket and the crown gasket with silicon lube and tested the closed case for water-resistance. 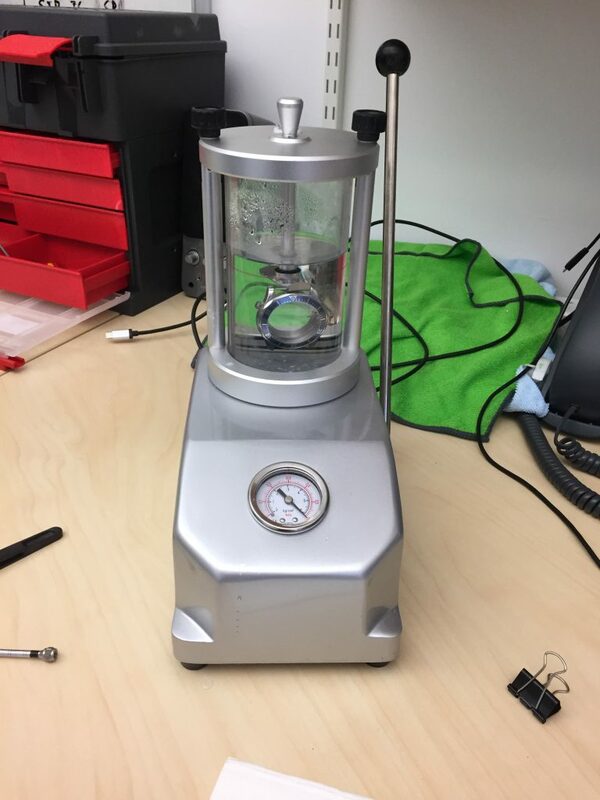 I did the proper test where I left the case under pressure for at least ten minutes and only then submerged it and released the valve. The case passes without any issues. 60M WR. I would be happy to even go diving with it, but will for sure use it for snorkelling. I set the bezel, glue the insert into place with a few dabs of gorilla glue (there are some adhesive strips available for bezel inserts, but they often don’t do a god job in my experience). I reassemble the watch, and admire it. – case and bezel ring (I have the gen ring, just wasn’t able to use it). I add the steel bracelet, set the watch and put it on my wrist, where it is right now.